While the Turtles are suffering from “Turtle Pox,” a disease that affects only mutant Turtles, Krang has developed a robotic turtle that he calls Metalhead in an effort to destroy the Ninja Ts. But first, in order to program the robot, Krang needs a “Brainalyzer” scan of the Turtles. Shredder, Rocksteady and Bebop travel up to the surface and force the Turtles out of hiding by breaking into various business establishments throughout the City. Sure enough, the Turtles arrive at the scene of the crime, allowing Shredder to zap them with the Brainalyzer and making good their escape. The Turtles are confused but relieved to be back at home in their beds. 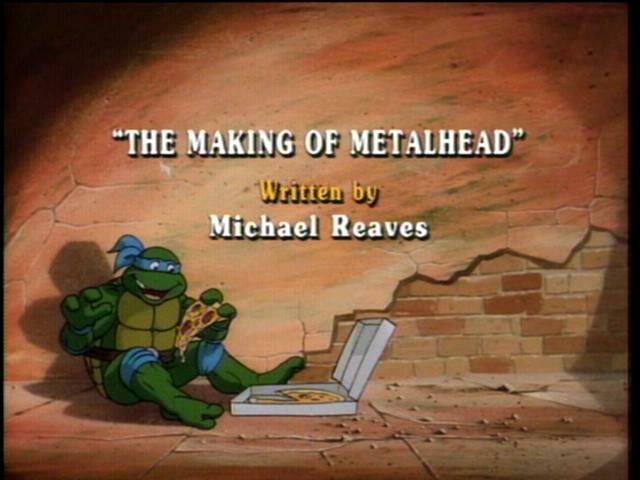 Back at the Technodrome, Krang programs the Turtles’ ninja skills into Metalhead. After a quick demonstration on Rocksteady and Bebop, Krang sends Metalhead (with a remote camera to witness their destruction ) to the surface to seek and destroy the Turtles. Meanwhile, Shredder, Rocksteady and Bebop arrive, to take possession of the Turtles only to find themselves being chased by Metalhead. Rocksteady fires a blast from his laser gun which causes Metalhead to go haywire – he can’t decide who to attack — so he attacks everyone. The Turtles chase the totally confused Metalhead atop a construction site while Donatello, who believes that he can rig some of the broadcasting equipment at Channel Six News Building to deactivate Metalhead before he destroys the Turtles or hurts himself, sneaks him up the transmitter room with April. One successful blast does the trick. Metalhead realizes that the Turtles are his friends. Once again, it attacks Shredder and company and, once again, they beat feet!